I wonder if costing U more is worth the extra thoughness and the flying to make this better than Swiftspear. yeah... this card is awesome. Its Flying so it has all the advantages that Delver has. But its also 2-mana so it dodges Misstep. Its haste is for killing planeswalkers. God I wish it was going to happen, but I just don't think it will. Swiftspear in vintage is honestly not fast enough since it needs so many other pieces that you likely should have just storm comboed anyway. Making it cost more for slightly more utility does not make it all of a sudden that much better. All things considered, is this card actually much better than just playing a swiftspear and hitting it with leap on the kill turn. Same mana investment over all and same effective card investment, but leap works better if you have other prowess creatures in play already and can be cycled when dead on your opponents cards. Well... yeah... because in Vintage, when you cast "leap" you're also countering a spell, drawing a card, resolving a new mana source, or some other such nonsense. I think you misunderstand my use of an obviously unlikely example as a serious reco as opposed to a method to illustrate why I do not think this new card will be viable. 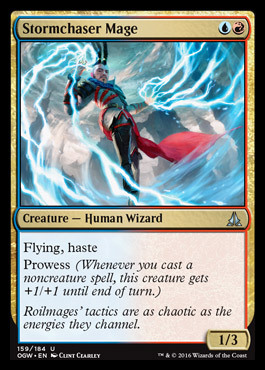 But for what it's worth and to spell it out, leap plus swiftspear gives you the same thing for the same net card investment and the same CMC as this new card, but with +1 power. I don't see swiftspear in any lists, so why would I presume that giving it leap suddenly puts it over the top. Decks just do not seem to want this type of card. Delver's strength was primarily in the Shops match up. This card would have a different function in the decks interested in running it - it does seem pretty sweet for killing planeswalkers but that's generally not been a problem for Young Pyromancer and Co. I have an honest question: how much better is this compared with wee dragonauts or kiln fiend? Those are 2 cards I love (dragonauts made me win my only legacy tournament), but I'm not sure they are valid anymore in vintage. Also I love nivmagus elemental, who never left my shoes box. Sure, prowess is better, but +2/0 and +3/0 end the game faster. I don't ignore the fact Stormchaser is way better against bolts and to some extent, toxic deluge and dismember. This has flying every turn not just when you cast leap. It is also blue and exiles to force which I think is it's most relevant advantage to Swiftspear in vintage. The comparison between this card and Swiftspear is similar to the comparison between Young Pyromancer and Monastery Mentor. It costs one more mana but has significant advantages for doing so. If the Swiftspear was your primary plan to begin with then you'd want to play 4 so that you're going to draw one early. Playing 4 of this means you don't regret drawing the second copy when you'd rather have the blue card for force to defend the first one. Also it is not dead if they have a blocker and dies to almost nothing at 2 mana in combat. I think Monastery Swiftspear's big brother is vintage relevant. The age of vertically-growing creatures is over. This dies to Abrupt Decay, Bolt, Dismember, and other Mentor answers, and even when it sticks around it can't race Pyromancer or Mentor. This card will be played in UR and URG Gush aggro decks. It cannot race Mentor alone (although it can probably give you more than 1 headache with a delver and a Walk) but it can kill your opponent while you stall the board with Pyromancer tokens blocking monk tokens all day long. I think we had this conversation about Managorger Hydra, which was probably the high water mark for vertical growth. Now, if we had some card that easily protected single creatures but not multiple ones against bounce, death, AND exiling in a single package, then we'd have something to talk about. There's an Urza's Saga land that regens a creature, but that's not enough. Another thing that could give us more vertical growth again are ways to punish horizontal growth like, say, a Pyrostatic Pillar that hits creatures as well. Absent that, I think you're spot on. If you want to play this dude and protect him, I think you need to run something that gives him Hexproof, as it is the only viable thing that can deal with abrupt decay. Mizzium Skin is likely the go to choice there, but I don't think that card has even seen the light of day in mentor, where the whole deck is devoted to protecting your creature wincon, and the overload in that deck makes even more sense than it does here. Still cant believe that this would be the go to deck though, when you have pryomancer and Mentor to choose from already. Where is this card really better than those 2 on a regular enough basis? Hexproof you say? Clout of the Dominus gives him +2/+2 and shroud, and haste x 2 so it can attack the turn before he enters the battlefield. Just kidding, I think these kind of creatures don't need hexproof, just play some missteps and countermagic to ensure you don't lose the game, and only to protect the creature if you really need it. It's perfectly playable, just like Managorger is ... but you better craft your deck to punish the token strategies, which likely means playing Black if you aren't building to the cards strengths your efforts will fail. I agree with your point on needing to play black to support that sort of strategy, but if I am going black in a Gro sort of deck I would make room for Yag will/Tendrils before Stormchaser. This is the sort of card I would usually give a twirl but I have had such underwhelming experiences with other vertical cards lately, including Myth Realized and Managorger (and i LOVE Managorger) that I can see the let down a mile away. Delver is just a better card in my opinion. This guy does do something that earlier vertical or horizontal growth creatures cant: flies over moat. Maybe a Raka build with Moat that punishes the other gro-style decks could be a home? Plus Moat triggers prowess. Moat is also relatively safe as a card vs the mentor or pyromancer decks, but less safe than it was because the chalice restriction has upped the playability of nature' claim.